Recently Geeks of Doom was invited to attend the Captain Marvel press conference, where we got to chat with stars Brie Larson (Captain Marvel), Lashana Lynch (Maria Rambeau), Jude Law (Yon Rogg), Gemma Chan (Doctor Minerva), Samuel L. Jackson (Nick Fury), and Clark Gregg (Phil Coulson). In this interview, Larson, Lynch, and Chan talk about being more than just a superhero in the Marvel Cinematic Universe. See what they had to say below. 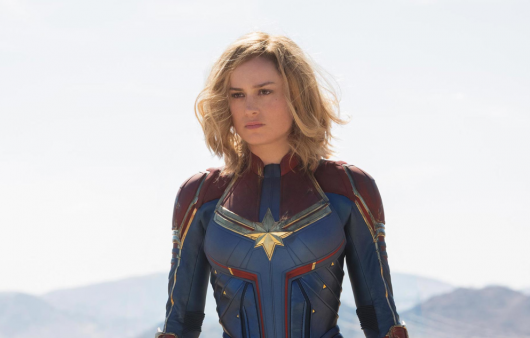 Though there have been many strong female characters in the Marvel Cinematic Universe, Captain Marvel is the first time that Marvel Studios brings its fans a female superhero standalone film. The film sees Brie Larson play Carol Danvers, a highly skilled soldier of Star Force, an elite Kree peacekeeping force, separated from her troop when she crash lands on the planet Earth. Determined to reunite with her team, she soon discovers that she has a deep connection with this planet, and starts to search for the clues that could help unlock the memories of her mysterious past. We were invited to attend the Captain Marvel press junket with our fellow journalists to talk to Larson, Lashana Lynch (Maria Rambeau), Jude Law (Yon Rogg), and Gemma Chan (Doctor Minerva). Additionally, MCU alum members Samuel L. Jackson (Nick Fury) and Clark Gregg (Phil Coulson) also attended to chat about appearing in the upcoming film. As much as this is a continuation of the Marvel Cinematic Universe, Captain Marvel holds so much more meaning for the studio. It’s Marvel Studios’ first female standalone film, and one with such an empowering message and a character who will be a symbol of inspiration to everyone, especially young girls. And that would not have been possible without directors Anna Boden and Ryan Fleck, who took their character-driven story approach to the upcoming film. Find out more about their leap from small films to Marvel Studio blockbuster tentpoles below. Marvel Studios has come an incredibly long way since they released Iron Man back in 2008. Since then, they’ve firmly established their dominance at the box office and built a very secure fanbase while also expanding their Marvel Cinematic Universe. But even though there are strong female characters within this shared universe, none have actually led a standalone film. That is until now. 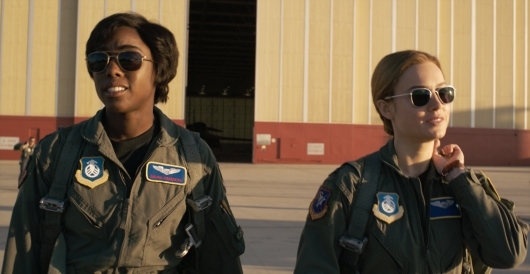 Now, we have Captain Marvel, a supercharged film that takes flight from the moment it starts and never looks back. It’s a truly visually stunning effort that has a lot of fun with some 90’s nostalgic vibes and nods to previous Marvel Studio efforts. But it’s something so much more at the same time. This film will be something that inspires and empowers females and young girls to fly higher, further, and faster than they ever did before. Check out my full review of the film here below. When Marvel Studios releases Captain Marvel this week, you can expect audiences to have their full attention on the title character as she lights up the screen. 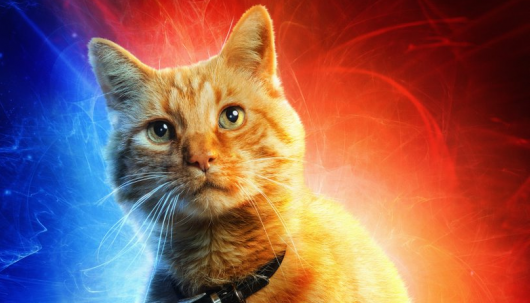 However, there’s one particular character that might steal the show: an orange cat named Goose. But don’t let his appearance fool you — Goose is actually a flerken, a mighty and powerful alien that just happens to look like a feline. Geeks of Doom was invited to attend the Captain Marvel press conference, where Brie Larson (Captain Marvel), Lashana Lynch (Maria Rambeau), Jude Law (Yon Rogg), Gemma Chan (Doctor Minerva), Samuel L. Jackson (Nick Fury), and Clark Gregg (Phil Coulson) talked about what it was like to work with a “snack-oriented” cat and his three other stunt doubles, as well as letting a cat do their thing while filming, and how the cats demanded respect. Check out what they all had to say here below. Marvel Studios’ Captain Marvel will be their cinematic shining example of female empowerment. Literally. The character, who just glows with photon power, will be making her big debut come early March when her first standalone film is released. In it, Brie Larson plays Carol Danvers, a noble warrior hero of the Kree’s peacekeeping military force, Starforce. But when a mission goes bad, she finds herself on Earth, where the enemy Skrulls have already infiltrated. Determined to stop them, she learns that she may have had a past life on this planet. On her journey of self-discovery, she comes to find out that she may have had more power in herself than she originally thought. We were fortunate enough to sit down with our fellow journalists at a press conference in LA, where Larson, along with Lashana Lynch (Maria Rambeau), Jude Law (Yon Rogg), Gemma Chan (Doctor Minerva), Samuel L. Jackson (Nick Fury), and Clark Gregg (Phil Coulson) chatted about the film. Check out what Larson had to say about finding that inner strength to become Captain Marvel and why it is so important to push for more inclusivity below. Marvel Studios’ Captain Marvel will be their first female standalone superhero film. 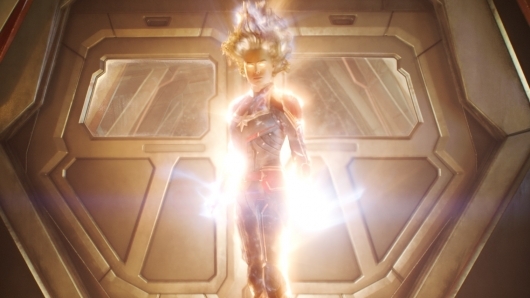 Starring Academy Award-winning actor Brie Larson as Carol Danvers, a human who has been augmented with Kree powers which she will use to stop the Skrull invasion. Though we are still a little over two months away from the film’s release, we are still getting some exciting promotional material leading up to it. So in addition to the special preview video that was released earlier this week, we now have a new featurette that details Larson’s preparation for the role, which included training at the gym and at an Air Force base where she learned what it was like to be in a dog fight. Check out the entire video below. By March of this year, the world will know who Carol Danvers (Brie Larson) is when Captain Marvel is released. Though Nick Fury (Samuel L. Jackson) sent out a distress signal to her in Avengers: Infinity War, we still don’t know much about one of the most powerful female superheroes of the Marvel Cinematic Universe. However, her standalone film will explain her origins and hopefully tell us why she has been missing for the better part of 10 years. We won’t get that answer in any of the trailers, however, this new special preview video should be enough to hold us over until the film’s release in March. Check it out below.